When a loan payment is not made, it is up to us to take the necessary actions to increase the likelihood of recovering any missed payments. 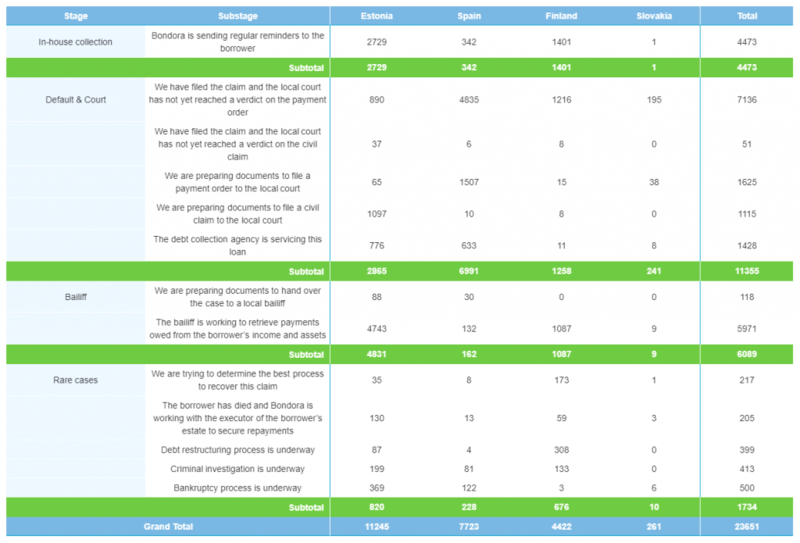 There are several methods to recovering a missed payment, and to do so, Bondora utilizes a 3-step collection recovery collection process. This process flow has been carefully designed by the Bondora team to increase the likelihood of loan payment recoveries. In rare cases, Bondora may need to initiate alternative methods of debt collection to recover lost payments. These alternative methods are considered rare and only used when absolutely necessary as deemed by a set of given circumstances. Bankruptcy & Debt Restructuring: Occurs if the bailiff has not been able to collect the debt from the borrower’s assets and accounts. Bondora can either initiate the bankruptcy on its own or join an existing filing. Generally, a new payment schedule is created and the court designs a distribution plan. Civil Case: Bondora can create a civil case to sue the borrower if they do not pay back their debts, and in turn, violate their legal obligation. This requires the use of lawyers and is a more in-depth and expensive process. Criminal: If the borrower has come under criminal proceedings their loan is frozen until the local authorities complete their investigation. In such a case it is highly unlikely any funds will be recovered. Deceased: Following the death of a borrower, Bondora works with the executor of the borrower’s estate to secure overdue payments. If the estate does not have sufficient assets to pay the debt obligation, and recovery seems unlikely, the loan is written off. It has been previously noted that October was a record-breaking month for Bondora in loan originations. Another positive sign from the month was an overall decrease in recovery cases. The number of loan recoveries dropped from 3.7% to 23,651. This decrease was most heavily seen in Finland, which saw collections and recoveries fall by 28.4% to only 4,422. Recovery cases being handled by the local bailiff dropped by 64.8%, and Bondora has prepared and filed all documents with the local bailiff in these cases. In fact, of all cases in the bailiff stage, only 1.9% are awaiting Bondora to prepare documents to hand over to the local bailiff. At Bondora we do our best to prepare documentation and paperwork for unpaid debts as quickly as possible, allowing local authorities to step-in and streamline the recovery process. Meanwhile in Estonia, claims rose to 11,245 on the month. Yet most of these additional claims are in the preliminary in-house collection stage, which grew over 7%. Estonian loans in rare cases – where recovery is much less likely – increased from 810 cases to 820. Spain had most of its increase in claims cases being taken on by debt collection agencies, and Slovakia had the exact same amount of claims as last month. When issuing millions of euros in loans, non-payment will always be an issue. However, just because a borrower misses several payments does not mean they do not have the ability to pay back their loan in due time. This is why at Bondora we have used our decade of industry experience to create a streamlined process in creating the most opportunity in recovering missed loan payments. This has allowed us to nip claims in the bud, and recover a cash flow back to our investors.